Murals ornamenting the oldest villa in the ancient town of Stabiae, the villa Arianna, underwent conservation by the team of professionals from the Faculty of Conservation and Restoration of Works of Art, Academy of Fine Arts in Warsaw. Stabiae, next to Pompeii and Herculaneum, is one of the cities that were completely destroyed during the eruption of Vesuvius in 79 AD. The first season of work has just ended. A group of five students under the supervision of Dr. Krzysztof Chmielewski and Julia Burdajewicz from the Ethnographic Archaeological Monuments Conservation Laboratory of the Academy of Fine Arts in Warsaw, returned to Poland after a few weeks of work. “Our work included the most urgent treatments to strengthen paint layer and plaster layer in two rooms inside the oldest mansion in Stabiae, called Villa Arianna” explained Julia Burdajewicz. Both interiors conserved by the Poles, although small, were fully decorated with wall paintings, almost four meters in height. All depict geometric, multi-coloured imitations of marble cladding, architectural elements such as columns, pilasters and richly decorated cornices. 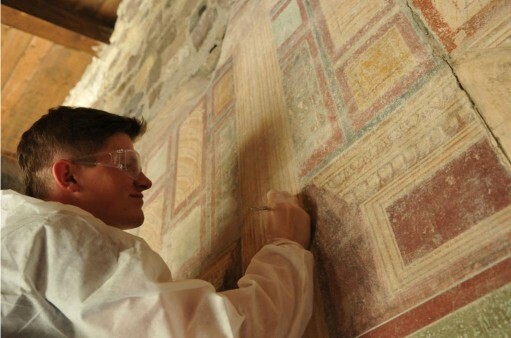 “The paintings, made in fresco technique, belong to the few so well preserved examples of the early phase of the second Pompeian style (half of the 1st century BC), and for this reason these rooms are considered to be among the most important in the villa” added Dr. Chmielewski. Conservators also began removing thick layers of dirt, efflorescence and substances from previous restoration interventions from the paintings. The conservators also managed to restore former intensity of colour to a large extent. Now the rooms, which had been closed due to the bad state of preservation of the frescoes, are again open to the public. Residences in the ancient town of Stabiae on the Bay of Naples were excavated in the 18th century from the ashes of Vesuvius, which fell as a result of the volcanic eruption in 79 AD. A similar fate befell the nearby Pompeii and Herculaneum. Stabiae consisted of a dozen vast mansions, inhabited by wealthy persons, as evidenced by the discovered monuments and sophisticated murals. However, the identity of the residents has not been established to this day. After the completion of the surveys, the villas were buried again. They remained underground until the 1950s, when they were unearthed again and subjected to comprehensive restoration work. “Today, after decades, despite numerous, but usually ad hoc interventions carried out in the past, many paintings require comprehensive restoration, which would save these valuable works of art” said Burdajewicz. Polish conservators came to Italy under an agreement with the Italian-American foundation Restoring Ancient Stabiae and the Italian conservation services (Soprintendenza Speciale per i Beni Archeologici di Pompei, Ercolano e Stabia).